Jerick McKinnon and the Minnesota Vikings are in first place in NFC North with a 6-2 record. 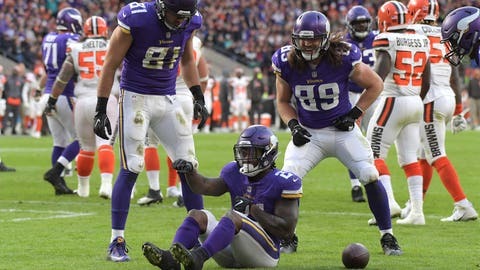 EDEN PRAIRIE, Minn — The Minnesota Vikings took a 6-2 record, control of the NFC North and deep confidence in the depth of their roster into their bye week. “Just see where he is at, where the team is at, how Case is doing. The whole deal. Sam, how he is doing,” Zimmer said. “He’s been slinging it,” said Keenum, who true to form as a career backup has refused to express any frustration about the uncertainty of his status. “It’s my job to be the best quarterback that I can be for this team, whatever role that is,” Keenum said.